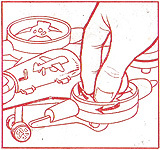 Instruction sheets for the three larger toys exist in three different print colours, most likely to quickly identify the right version when packing the toys. Red printing was used for Spacex; GA toys came with sheets printed in blue or black depending on destination market. Clean artwork to print your own instruction sheets is included on each page. This fits on A4 or letter-sized paper, and can be downloaded as a pdf file by right-clicking the link and choosing "Save linked file as", "Save target as" or similar.